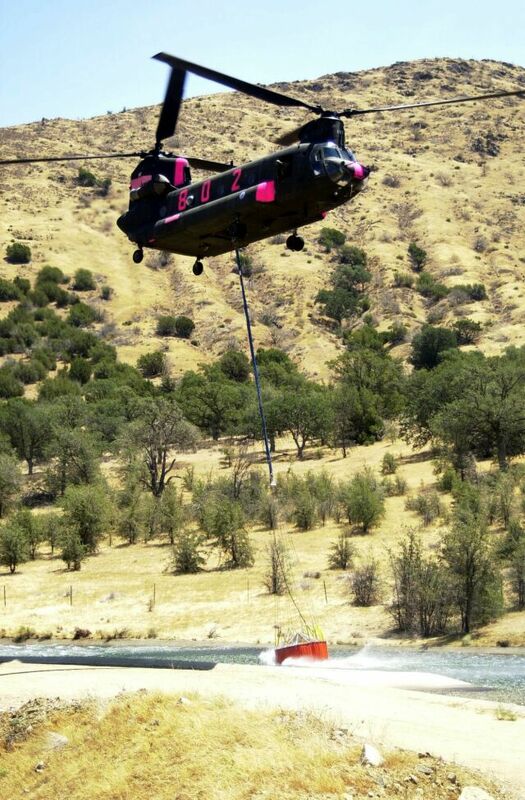 Kernville, California, USA, 08 August 2000 — A California Army National Guard CH-47 Chinook helicopter wrenches a 660-gallon water bucket out of an aqueduct to deposit water on fires still smoldering in the Sequoia National Forest near Kernville, California. More than 2,300 service members from the Army, Marines, Air and Army Guard and Air Force Reserve are conducting firefighting and support operations for the Western wildfires in response to requests from the National Interagency Firefighting Center in Boise, Idaho, and as directed by the governors of several states. The Chinook and its crew are attached to Company G, 3rd Battalion, 140th Aviation based in Stockton, California. DoD photo by Sgt. 1st Class Eric Wedeking, Army National Guard.